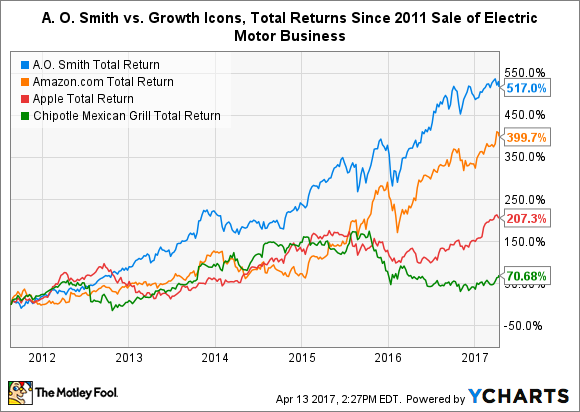 Have Investors Been Overlooking A. O. Smith Corp? If you enjoy using clean, hot water every morning, then your portfolio may enjoy giving A. O. Smith Corp stock a closer look. Let's talk about one of the best stocks on the market for buy-and-hold investors based on both past performance and future potential. When dividends are included, it has outrun some of the market's favorite growth stocks, having bested the 10-year performance of Chipotle Mexican Grill and the five-year performance of Amazon and Apple. However, this company doesn't sell flashy technology like an electric car, or promise the next big consumer product, nor will you find its corporate offices in an overpriced Silicon Valley zip code. While it boasts an illustrious industrial history that ignited the early days of the auto industry and helped the Allies win World War II, Milwaukee-based A. O. Smith Corp's (NYSE:AOS) business today is driven by a staple of modern living: hot water. The water-technology specialist achieved record sales and earnings in 2016, but several significant growth opportunities in Asia promise future growth for years to come. Investors who may have been overlooking A. O. Smith should give it a closer look. In 2011, A. O. Smith sold its electric motor business -- the last remaining piece of its auto industrial past -- to focus exclusively on becoming a leading global water-technology company. While the company had designed, manufactured, and sold water heaters for decades, the divestiture provided management more bandwidth for acquisitions and global expansion in its new core market. There's no denying that the company has been on a roll since. Today, A. O. Smith sells water heaters, boilers, and water-treatment technologies to both residential and commercial customers. It generates the bulk of its sales in North America, which provides a steady base for operations and powerful cash flow. The largest growth opportunities, meanwhile, reside in China and India, where the company has been executing against long-term strategies to build leading market positions. Aside from a global economic slowdown, there isn't much that should stop A. O. Smith from growing for the foreseeable future. But not all growth is created equal. The driving forces behind the company's growth differ by region. In established markets such as North America, residential and commercial customers are increasingly gravitating toward high-efficiency products for replacements and new construction. For example, sales of commercial gas water heaters that achieve greater than 90% efficiency have more than doubled since 2010, while high-efficiency condensing boilers will soon account for more than half of annual sales for all commercial boilers. A. O. Smith specializes in both. It's important to note that, while North America provides a stable foundation for the company, growth remains limited outside of commercial markets. That's because over 85% of residential water heaters sold on the continent each year are replacements rather than new construction, which is why the company focuses on high-end, higher-margin products in the segment. There are opportunities for the company's direct-to-consumer home water-treatment systems, but the residential market is relatively mature. In less established markets such as China and India, growth is driven by the rapid expansion of middle-class populations. Acknowledging a trend is easy. Crafting and executing a comprehensive strategy for capitalizing on a trend is the difficult part. The good news for investors is that the latter point wasn't lost on management at A. O. Smith, which began building brand recognition and distribution channels in China and India years ago. In fact, it was one of the first North American companies to enter the residential water heater market in India in 2008, although the opportunity in the country remains largely untapped and the business is still in its infancy. Last year, sales in India amounted to just $18.2 million. The company has had a presence in China for considerably longer -- and it shows. In 2002, A. O. Smith commanded just 5% of the residential water heater market in the country but is now the leading brand with over 25% market share. The company also sells water-treatment products (the leading brand with 26% market share) and air purification products (a relatively new offering) in the region. The company's water heaters are sold at more than 9,000 retail outlets, which include over 2,500 exclusive sales partnerships. Thirty percent of outlets are in China's largest cities. The company's water-treatment and air-purification products are sold at more than 6,500 and 2,500 retail outlets, respectively. In 2016, e-commerce sales in China amounted to $200 million, or 23% of revenue generated in the country. The company expects the number of Chinese households with one of its products to grow from just 18 million in 2010 to over 180 million in 2020. For reference, there are only 126 million households in the United States. The long-term strategy implemented by management years ago has been paying off for investors. Last year, China accounted for one-third of all revenue, or $887.9 million. That's up from just $50 million in 2003. Better yet, management thinks it can deploy a similar strategy with minor tweaks to capitalize on the long-term opportunity in India. If it proves successful, then the business could see above-average growth for many years into the future. A. O. Smith doesn't own a flashy business, but it's a leader in nearly every market segment in which it operates. That includes top market positions in residential water heater sales in North America (40%) and China (25%), residential water treatment sales in China (26%), and commercial water heater sales in North America (53%). It has a stable foundation of high-margin business in North America and ample growth opportunities in China and India. It isn't afraid to make strategic acquisitions to grow more quickly. It pays a respectable dividend yield of 1.1%. And most importantly, it focuses on long-term opportunities and trends to drive its business forward. If you've been overlooking the stock until now, you should definitely give it a closer look.